Host Your Own Private Events! What cities use the ReQuestz App? How do I obtain DJ access on ReQuestz? How does a guest become a Venue VIP? Can I move from Bronze to Diamond? 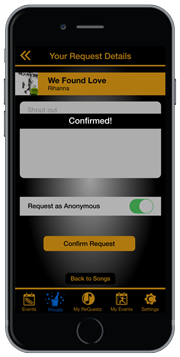 The ReQuestz App is designed to simplify and redefine the nightlife process! Guests have access to guest lists, promotions, VIP reservations, song requests, and shout outs all within the ReQuestz App. 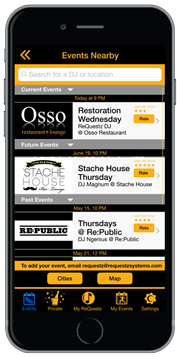 ReQuestz bridges the gap between the venues and guests who attend. 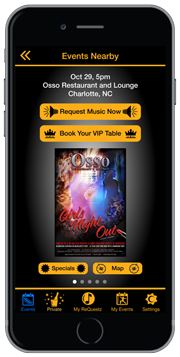 The ReQuestz app displays the hottest venues and the top DJs available in your location. If you do not see a venue or event available in your location, please contact us. With this patent-pending app, it is not just about the music and having a good time, it is about Redefining the Nightlife Experience! If you are interested in having your own public or private event, please read below or contact us. ReQuestz is THE app to have! 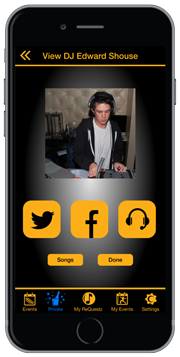 After you sign up with ReQuestz as a DJ, you will be able to create your own personal profile. Add an avatar, Facebook, Twitter, and website links to reach out to your fans. If you would like to add a location not already in our database, please contact us and let us know! After you sign up with ReQuestz as a venue, it becomes your new marketing platform, exclusive to the clientele who you want your venue exposed to. You will be able to create events, promotions, table names, reservation prices, build guest lists and rewards packages. There is so much more you can do, we can’t wait for you to be a part of the brand! If you venue is not in our system, please contact us and let us know! The ReQuestz app loads the hottest events based on your GPS location. You may see multiple events or none. If no events appear, that means we haven’t reached your city just yet. To see events in other areas, go to the ‘Cities’ section and choose a city where ReQuestz has events listed. If you would like an event added, please contact us and let us know! When you add your event, you should be able to view it immediately on the ‘Events Near You’ page in the ReQuestz App. 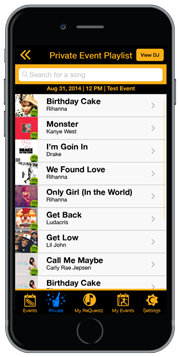 Guests are then able to send you song requests and shout outs from the playlist you created. This app gives you control over what is played. You can view other events available worldwide using our ‘Cities’ section in the Events tab. If you would like a venue added, please contact us and let us know! ReQuestz is an exclusive marketing platform that will house all the information about your venue and events. After you have created an event, a push notification will be sent to all guests in that city informing them of your event. The guest then has access to reserve their table, join the guest list, and send shouts outs and song requests directly to the DJ. Create customer loyalty and exclusivity at your venue, which will in turn attract more customers. If you do not find your venue in our database, please contact us and let us know! View the promotions page after selecting an event to see if that venue is giving out any free promotions or exclusive rewards for their venue. If not, go back to venue page, press the ‘Request Music Now’ button and request away! Would you like to test the ReQuestz app? Go to the ‘Private’ Tab in the app and input the code: test. Send us a request and shout out if you choose. We will do our best to post them on our Twitter, Facebook, and Instagram pages for you to view. 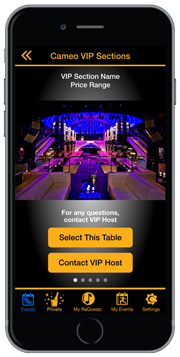 Directly from their mobile device, the ReQuestz App provides exclusive access to guests wanting to be added to a venue’s guest list. Forget dropping a name at the door for entry or having to text someone inside to come outside to get you. 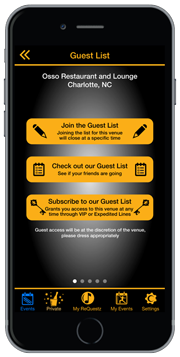 The ReQuestz App gives exclusive access to guests joining the guest list, as long as they follow the venue’s rules and guidelines. Please dress appropriately and be on time! Guests will no longer have to ask their VIP server to give the DJ a song request or shout out, or even worse, break the venue’s rules and approach the DJ directly. 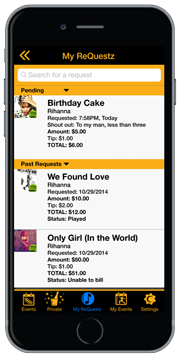 The Requestz app gives you direct access to a DJ’s playlist. Open ReQuestz, select the venues playlist, and request away! 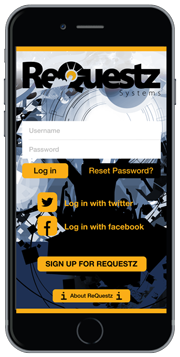 ReQuestz Systems wanted to reduce the time it takes to reserve a table and pay for a table at different venues. Texting back and forth with a VIP manager to find a table can be frustrating and even exasperating when you are trying to make a reservation or see if there are any tables left. Instead, the ReQuestz App lets you reserve and pay for the exact table you want, if it is available, before you arrive. The traditional method to find out about fees and specials the venue is offering is by texting, emailing, or calling. 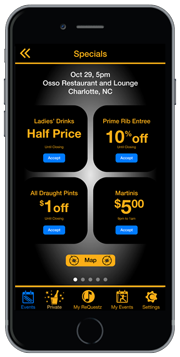 The ReQuestz App lets you access information about fees, drink specials, free requests, and more with the click of a button. ReQuestz will organize your events, add RSVPs, and much more with just the click of a button! The app is a free download. Song request fees for public events depend on the venue/DJ. The ReQuestz App has free public song requests. Private events (weddings, birthdays, anniversaries, corporate events, etc.) have a one-time fee. 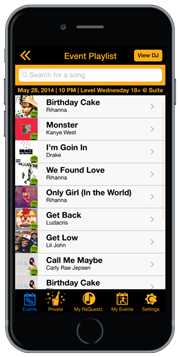 For private events, song requests are always free in the ReQuestz App. For more information, please contact us. The ReQuestz App always has free access to the Guest Lists. Guests must abide by venue rules, including following the dress code and arriving on time. Entry to a venue is not possible after the Guest List time closes. Table reservations vary depending on the venue/event. You can reserve and pay for a table directly from the ReQuestz App. Receipt of purchase is sent to you via email. A VIP Manager will email you with arrival time and dress code details. 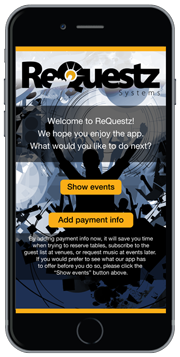 There are no fees for DJs, because ReQuestz Systems believes DJs need to experience all the capabilities of the ReQuestz App. For DJs, public events are always free, but private events are free for a limited time. 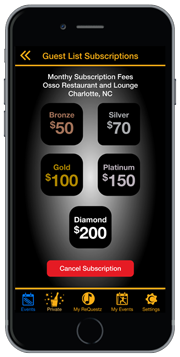 Venues pay a monthly licensing fee to list public events on the ReQuestz App. Venues wanting to list private events will be charged a fee for each event. For a venue’s exclusivity, there are fees for public and private events. Public Events have a monthly fee. Private Events have a per event fee. For inquires on our licensing fees or how to become a part of the revolutionary ReQuestz app, please contact us. Charlotte, North Carolina, is ReQuestz’s main market. 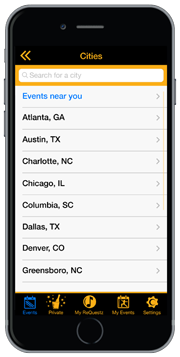 To view Charlotte and other cities’ events, press the ‘Cities’ button to go to the ‘Cities’ page, and select a city. For more information, please contact us. To obtain DJ access, email us at requestz@requestzsystems.com with your DJ name and the locations where you perform. We will reply in 1–2 business days. You must attend an event before becoming a VIP. ReQuestz Systems’ revolutionary technology can confirm whether you joined the Guest List or actually attended an event. 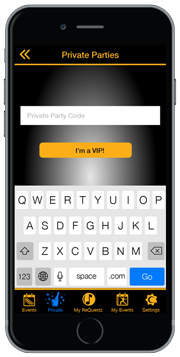 Yes, you can become a more exclusive Venue VIP by paying a one-time fee through the ReQuestz App. Fees are determined by the venue. Alexander is a young entrepreneur who dreamed of creating a more efficient and effective nightlife experience. He noted that going out and spending large amounts of money on beverages and food for the evening was very one-sided. It dawned on him: why not create an experience that allows guests to enhance their own nightlife experience within the venue itself? Your own personal nightlife experience app. The key for Alex when creating the idea was how it saves time. He believed texting to gain information about entry fees, guest list, and VIP tables and song request was outdated. So he created something that simplifies all those processes into one app. Venues currently push all their revenue through door and liquor sales. 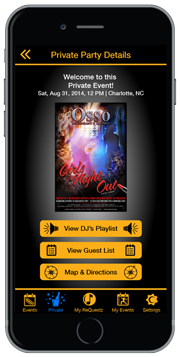 Why not have an exclusive marketing app that creates sales by allowing guests to request music to the DJ? Why not create a system that keeps the venue and DJ in control of what is played that evening? Why not build a whole new revenue stream that has never been tapped into before? It was at that moment that ReQuestz Systems was born. Nick joined ReQuestz Systems in 2012. He has been a valuable member of the team and has created some innovative additions to the ReQuestz platform. A graduate of Cornell University, he enjoys the entertainment industry and seeks new ways to expand that market. Once joining ReQuestz, he has been an important contributor to the functionality that ReQuestz Systems currently has.